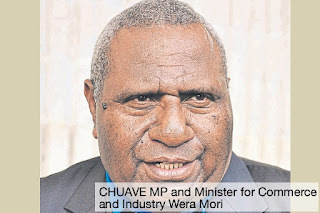 PNG's CHUAVE MP and Minister for Commerce and Industry Wera Mori, commissioned a new fleet of vehicles and earthmoving equipment for the Elimbari limestone and cement project in Chuave on Friday. “The equipment, trucks, vehicle and other needs to start the project have been purchased and we are now commissioning,” he said. Mori said Chimbu was a resource-poor province which now had a rare opportunity with the limestone and cement project. He said limestone was needed by all major mines in Papua New Guinea and the world. Mori said the development of Wafi-Golpu project in Morobe provided an opportunity for the people of Elimbari and Chimbu. He said they would restructure the project to accommodate the Chimbu government and other stakeholders. Mori said the first thing to do was to get integrated land group registration and register all members of Mam and Duma tribes into National Identification (NID). Commerce and Industry Secretary Andrew Liliura assured the people of Chuave that he would engage two experts to do integrated land group and NID registration for the landowners. He said the current Government and Commerce and Industry under Mori was committed to getting the project off the ground. Landowner spokesmen Rex Supa and Michael Minga called for the speedy integration of the land group and National Identification registration to kickstart the project.